Ganymede is one of Jupiter’s moons, and it has a sub-surface ocean under a solid layer of frost and ice. The moon shows signs of strike-slip faulting, or strike-slip tectonism. On Earth, this type of tectonic activity created features like the San Andreas fault, a seismically-active region at the boundary between the Pacific Plate and the North American Plate. Europa is considered a prime target in the search for life in our Solar System because of its sub-surface ocean. Europa is exposed to Jupiter’s intense radiation, but the icy sphere surrounding the sub-surface ocean may act as a radiation barrier, protecting life from its harmful effects. Not only is the sub-surface ocean protected from radiation, it’s warm. Though Ganymede is no longer tectonically active, Europa still is. So Ganymede’s present surface provides clues to what is happening on Europa now. And when it comes to planning missions to Europa like Clipper, or the Icy Moon Explorer, knowledge of Ganymede’s surface could help refine those missions and make them more effective. “The heavily fractured surface of Ganymede displays many distinctive regions of inferred strike-slip faulting that may be important to the structural development of its surface,” said study lead author Marissa E. Cameron. Cameron and the rest of the team studied nine locations on the icy surface of Ganymede to better understand how strike-slip tectonism shaped the moon’s complex surface. The team performed extensive methodical mapping of nine locations, relying on Galileo images from between 1995 and 2003. NASA had planned a mission to Europa called the Jupiter Icy Moons Orbiter (JIMO). It was to launch around 2015 and last until 2025. It’s main objective was to explore Europa and learn more about the sub-surface ocean on that moon. 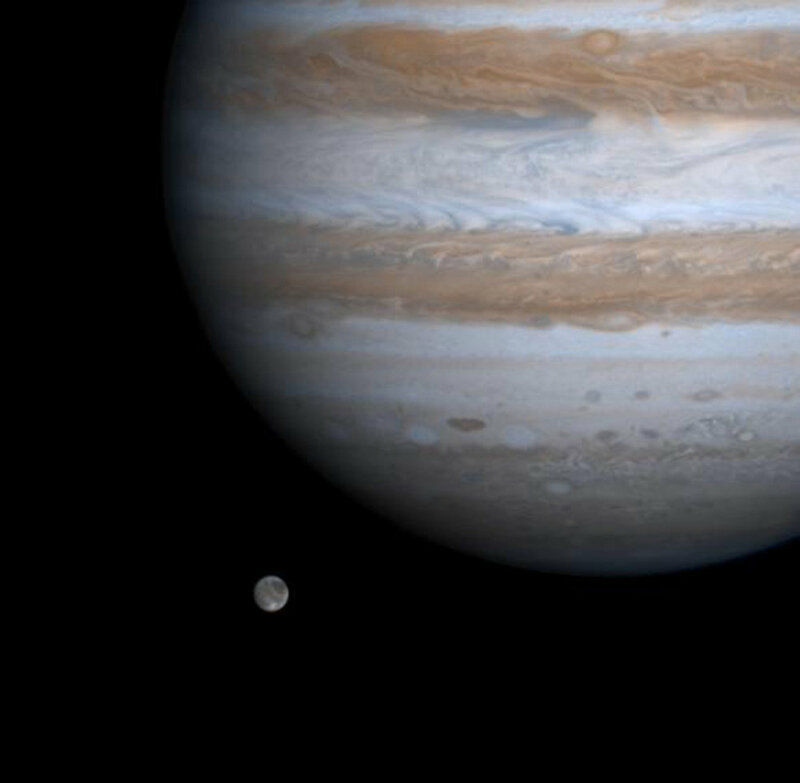 Ganymede and Callisto, which also may have sub-surface oceans, were secondary targets for JIMO. JIMO was a complex mission, involving an ambitions fission reactor as its powerplant. It also featured a complex assembly that called for three separate launches, with the three components assembled in orbit before embarking to Jupiter’s moons. It also called for a small lander to be deployed to the surface of Europa. Unfortunately, NASA switched its focus to manned missions, and in 2005 JIMO’s funding was cancelled. The European Space Agency (ESA) is working on the Jupiter Icy Moons Explorer (JUICE). JUICE will launch in 2022 to study Europa, Ganymede, and Callisto. It will arrive at the Jupiter system in 2029. JUICE will focus on the surface geology of Ganymede, especially the nature of the sub-surface ocean and the nature of the surface and the crusts. At Europa, JUICE will focus on the chemical ingredients for life, and on the presence of organic molecules. NASA has not given up on a mission to Europa even though JIMO was cancelled. They are busy working on the Europa Clipper mission, set to launch between 2022 and 2025. The Europa Clipper has a more simple mission profile than JIMO, with a single launch and a simpler powerplant. The Europa Clipper is still in the planning stages, so discoveries like past evidence of slip-faulting in Ganymede should help mission planners prepare the Europe Clipper.